By Nirav Shelat, D.O., Ricki Shah, M.D., D. Lee Bennett, M.A., M.B.A., M.D. A 15-year-old boy presented for a second opinion regarding management and treatment of a slowly developing limb length discrepancy. Past medical history included 2 years of chronic moderate to severe right thigh and knee pain. The pain was significant enough that the patient occasionally had difficulty sleeping. Ibuprofen relieved the pain to some degree, improving sleep. Physical examination and external radiographs revealed a limb length discrepancy with the right lower extremity significantly shorter than the left lower extremity. The patient was observed to walk with a limp. 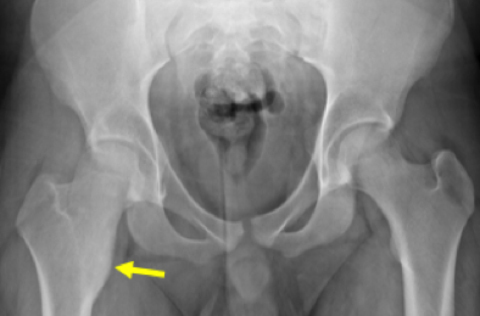 Given the degree of the patient’s pain, radiographs of the pelvis/hip were obtained (Figure 1A) along with a follow-up computed tomography (CT) study (Figure 1B). Common causes of cortically based sclerosis and thickening on radiographs include osteoid osteoma, chronic infection, and stress fracture. 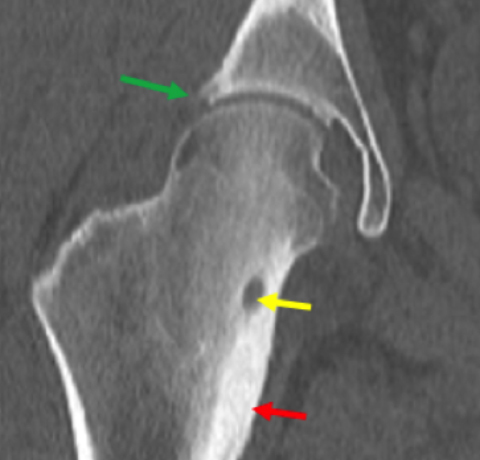 These entities often have a similar appearance on radiographs but can typically be differentiated on CT. On the rare occasion when the CT appearance of the sclerotic lesion remains nonspecific, MRI or a limited nuclear medicine bone scan can help further assess for a stress fracture not definitively diagnosed on radiographs or CT examinations. The case discussion below reviews the key clinical and imaging manifestations of these entities. Treatment of osteoid osteomas is initially conservative, with ablation performed in cases of unremitting pain. Intracapsular lesions are treated more aggressively to avoid premature osteoarthritis. Complications of ablation include thermal injury and fracture. Chronic osteomyelitis (Brodie abscess) can also cause cortical thickening, a lucent lesion, and subjacent bone sclerosis. Both osteoid osteoma and Brodie abscess can also be associated with fading sclerosis adjacent to the lesion (nidus or abscess cavity, respectively). However, a CT finding of osseous tunneling (or serpentine appearance) associated with and extending from the lucency helps differentiate between these two lesions on CT.8 The tunneling appearance extending from the lucent lesion is associated with Brodie abscess and not with osteoid osteoma. In addition, the presence of a soft-tissue abscess adjacent to the osseous involvement indicates chronic osteomyelitis. In cases where there is no tunneling or associated soft-tissue abscess, however, then osteoid osteoma and Brodie abscess can be indistinguishable on imaging, and biopsy may be necessary to differentiate between the two.9 Lastly, the presence of a sequestrum, which represents a dense region of devascularized bone with surrounding lucency on CT, is found with chronic osteomyelitis. It can, however, occasionally be difficult to differentiate between a sequestrum of osteomyelitis and an ossified nidus of osteoid osteoma. Another common cause of focal cortical thickening, or uninterrupted periosteal reaction, is a stress fracture. If the history and location of the cortical thickening are classic for a stress fracture, then additional work-up is not indicated. However, if either the focal cortical thickening or the clinical presentation are atypical for a stress fracture, then further evaluation would be warranted. In the setting of an atypical presentation with no demonstrable lucent stress fracture line on radiographs, CT is excellent at demonstrating the presence of a subtle lucent stress fracture. It is especially helpful in demonstrating cortical stress fracture lines and longitudinal stress fracture lines that are radiographically occult, unlike the oval or round lucency associated with osteoid osteoma or infection.10 When extensive cortical sclerosis is present in long bones, its appearance on radiographs can mimic both a stress fracture and osteoid osteoma. The presence of a cortically based nidus, in addition to a characteristic clinical history, would indicate an osteoid osteoma, while the presence of a linear fracture lucency on CT would indicate a stress fracture. Finally, regardless of the location, a more sinister etiology such as metastatic disease or sarcoma may be considered. However, these can usually be excluded if there are no aggressive features. The differentiation between osteoblastoma and osteoid osteoma is primarily a histopathologic one. Imaging features are identical, with the exception of size; osteoblastomas are the primary consideration when the lesion is > 1.5 or 2 cm. Common causes of cortically based sclerosis and thickening on radiographs include osteoid osteoma, chronic infection, and stress fracture. CT is helpful or even diagnostic in further evaluation of these lesions, often identifying key distinguishing imaging features, such as a linear lucency with stress fractures; lucent tunneling extending from an underlying focal lucent lesion with chronic osteomyelitis; and a round or oval lucent nidus within a region of cortical thickening and sclerosis with osteoid osteoma. Appropriate diagnosis through imaging, when possible, is essential in guiding management and treatment strategies. Kransdorf MJ, Stull MA, Gilkey FW, et al. Osteoid osteoma. Radiographics 1991;11(4):671-696. Afshani E, Kuhn JP. Common causes of low back pain in children. Radiographics 1991;11(2):269-291. Davis MA, Douis H, James SLJ. Primary bone tumors. In: Pope TL, et al, eds. Musculoskeletal Imaging, 2nd ed. Philadelphia: Saunders; 2015:924-943. Liu PT, Chivers FS, Roberts CC, et al. Imaging of osteoid osteoma with dynamic gadolinium-enhanced MR imaging. Radiology 2003;227(3):691-700.5. Chai JW, Hong SH, Choi JY, et al. Radiologic diagnosis of osteoid osteoma: from simple to challenging findings. Radiographics 2010;30(3):737-749. Erratum in: Radiographics 2010;30(4):1156. Radcliffe SN, Walsh HJ, Carty H. Osteoid osteoma: the difficult diagnosis. Eur J Radiol 1998;28(1):67-79. Davies M, Cassar-Pullicino VN, Davies AM, et al. The diagnostic accuracy of MR imaging in osteoid osteoma. Skeletal Radiol 2002;31(10):559-569. Wing VW, Jeffrey RB Jr, Federle MP, et al. Chronic osteomyelitis examined by CT. Radiology 1985; 154(1):171-174. Bonfiglio M. Case report 791. Bone abscess, chronic osteomyelitis. Skeletal Radiol 1993;22(5): 367-370. Anderson MW, Greenspan A. Stress fractures. Radiology 1996;199(1):1-12. Shelat N, Shah R, Bennett DL. Cortically Based Sclerosis and Thickening. J Am Osteopath Coll Radiol. 2016;5(4):23-25. Nirav Shelat, D.O., Ricki Shah, M.D., D. Lee Bennett, M.A., M.B.A., M.D. Dr. Shelat, Dr. Shah, and Dr Bennett are with the Division of Musculoskeletal Radiology, University of Iowa Hospitals & Clinics, Iowa City, IA.